Rental stores get a lot of requests for equipment. Mowers, excavators, tillers, loaders. All very exciting items with interesting project stories to go with them. Sometimes it's nice to focus on the boring rental items, like ladders, and explore the projects they they are part of. I recently followed a rented ladder to a homeowners house. She said she rented the 24 foot extension ladder to help her remove a satellite dish from the side of her house. She already owned a shorter ladder, but it did not reach high enough for her to safely remove the dish. 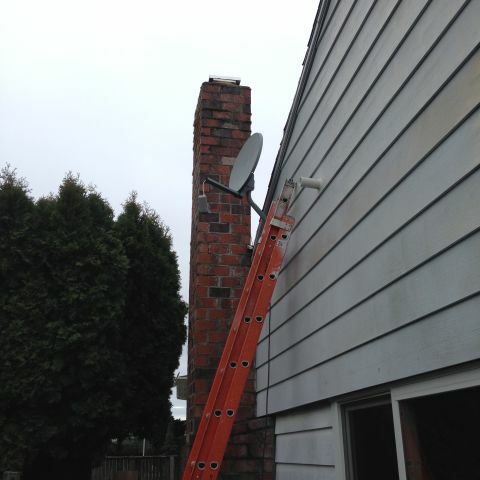 As you can see from the picture, the the ladder is probably only extended to 13 feet, but that was enough to enable her to get that dish off the side of her house.